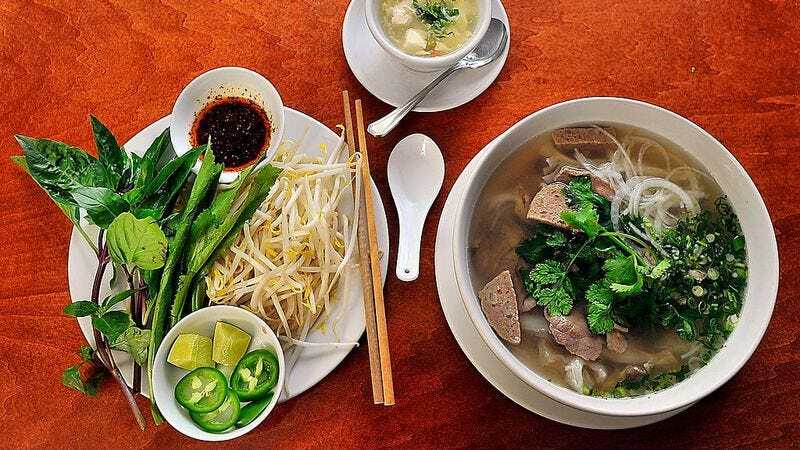 Read our interview with Andrea Nguyen, author of James Beard Award-winning The Pho Cookbook, and after your brain is primed for a steamy bowl of beef pho, learn how to make a quick and non-fussy version here. Peel then slice the ginger into four or five coins. Smack with the flat side of a knife or meat mallet; set aside. Thinly slice the green parts of the green onion to yield 2 to 3 tablespoons; set aside for garnish. Cut the leftover sections into pinkie-finger lengths, bruise, then add to the ginger. In a 3- to 4-quart pot, toast the star anise, cinnamon, and cloves over medium heat until fragrant, one to two minutes. Add the ginger and green onion sections. Stir for 30 seconds, until aromatic. Slide the pot off heat, wait about 15 seconds to cool a bit, then pour in the beef and chicken broths. Return the pot to the burner, then add the water and salt. Bring to a boil over high, then lower the heat to gently simmer for 30 minutes. While the broth simmers, soak the rice noodles in hot water until pliable and opaque. Drain, rinse, and set aside. Bring the beef to room temperature. When the broth is done, pour it through a fine-mesh strainer positioned over a 2-quart pot; line the strainer with muslin for super-clear broth. Discard the solids. You should have about four cups. Season with fish sauce and sugar (or maple syrup), if needed, to create a strong savory-sweet note. Bring the strained broth to a boil over high heat. Put the noodles in a noodle strainer or mesh sieve and dunk in the hot broth to heat and soften, five to 60 seconds. Lift the noodles from the pot and divide between the two bowls. Lower the heat to keep the broth hot while you arrange the beef on top of the noodles and garnish with the chopped green onion, cilantro, and a sprinkling of black pepper. Taste and adjust the broth’s saltiness to your liking one last time. Return the broth to a boil and ladle into the bowls. Enjoy with any extras, if you like. Notes: To take a shortcut for rare steak pho, buy about 5 ounces (150 g) of thinly sliced beef carne asada. Pound the meat a few times with a meat mallet to thin out further, then cut it into bite-size pieces for a quick pho topping.